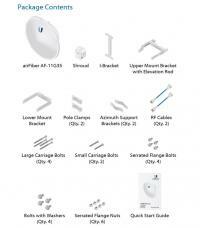 The AirFiber® AF‑11G35 antenna, designed for use in the licensed 11 GHz band. Break free of the crowded 5 GHz spectrum by pairing the airFiber AF‑11G35 antenna with the airFiber AF‑11FX radio (available separately), to create the endpoint of an 11 GHz high-performance, full-duplex, Point‑to-Point bridge or network backhaul. It delivers SISO or 2x2 MIMO, dual‑polarity performance. On the right is one example of how the AF-11G35 ntenna with the AF-11FX radio can be deployed as endpoints in a backhaul link to deliver bandwidth from a WISP network out to a neighborhood tower. From there, an airMAX® Sector antenna with a Rocket® radio elivers bandwidth to the WISP’s customers. 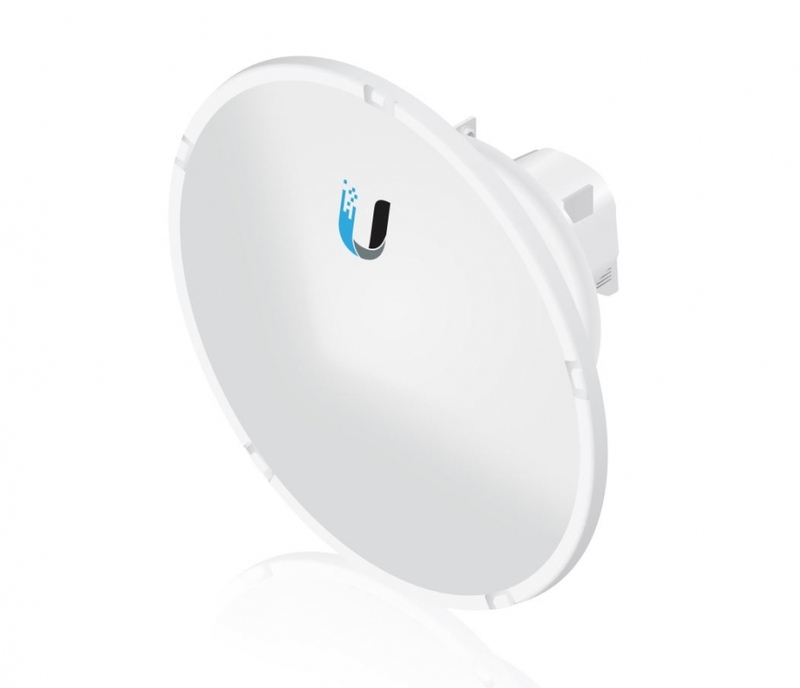 For existing Ubiquiti Networks® AF-5 and AF-5U installations, the AF‑11G35 provides a quick, convenient pgrade path to the licensed 11 GHz band. 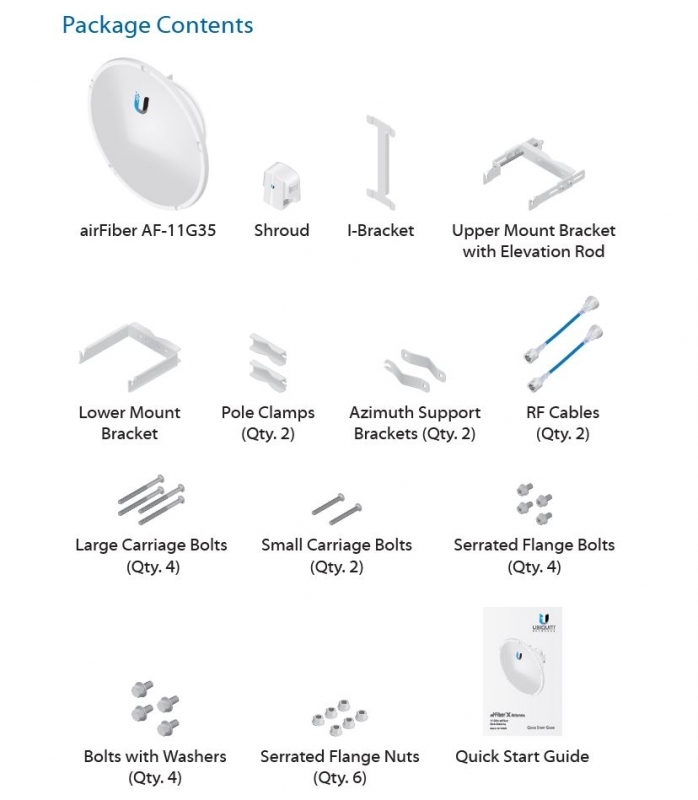 The airFiber AF‑11G35 uses the same antenna mount as the irFiber AF-5 and AF-5U – by simply swapping out an AF-5 or AF-5U with the AF-11G35, you can quickly and asily upgrade an unlicensed, full-duplex 5 GHz link to a licensed, full-duplex 11 GHz link. Incorporating a dish reflector design for excellent beam directivity, the airFiber AF-11G35 antenna features robust mechanical design using industrial‑strength hardware for outdoor application use. The AF-11G35 antenna has a built‑in mount for the AF-11FX radio, so installation requires no special tools. Snap the airFiber AF-11FX radio securely into place and mount the antenna; you then have the optimal irFiber X antenna and radio combination for your 11 GHz PtP application.